At the hotel, I admired the metro tiles and the penny round tiles on the floor, of course, but I loved the wallpaper with a passion usually reserved for silver shoes, savoy cabbage gratin or daytime buying-property-at-auction tv programmes. The wallpaper is Aviary by Schumacher. 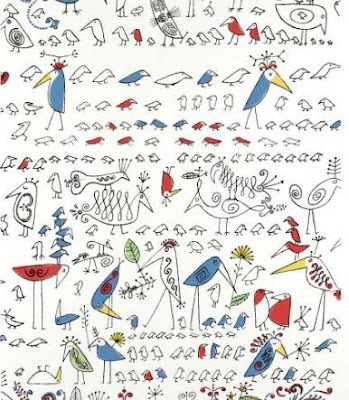 It was designed by Saul Steinberg, a cartoonist for The New Yorker, in the 1950s, and also comes in colour. 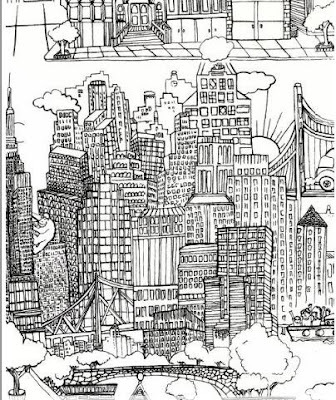 They also sell this charming New York wallpaper by the same illustrator, and there is also a similar design, Views of Paris. 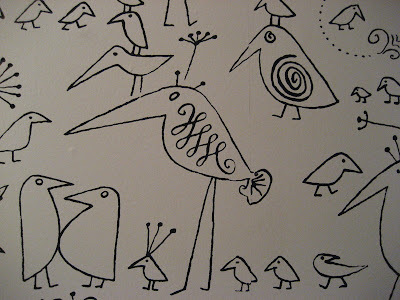 I'm wondering if there is a place for the Aviary design in my flat - but I think a fourth bird wallpaper might be a bird too far. Third image via Flickr. Bottom two images via The Peak of Chic. I really love it in the B&W - I could see it in a foyer. ohhh... that paris scene is to die for. I must find somewhere to incorporate that in my house! Love. I'm really liking the light in the picture shown as well... the up and the down light. It's so gorgeous! It's like they locked the artist in the bathroom and gave him a pen, because it looks so perfect in there. These wallpapers are blowing my mind. 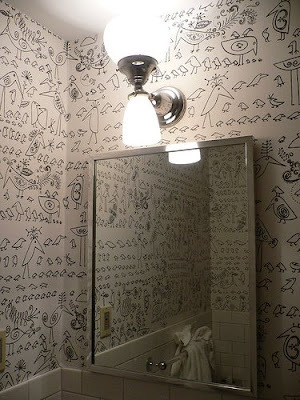 It's like having Saul Steinberg doodle all over your walls (which would be a good thing). 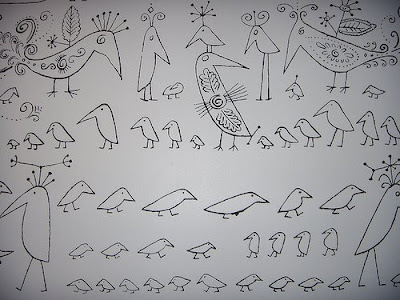 I love birds, and especially cute drawings of them! Great wallpapers! Ha! 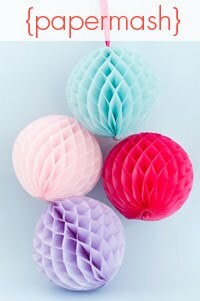 These are so neat!